Spinning band distillation is a unique distillation technique that has several advantages over traditional packed columns. High Efficiency: B/R spinning band distillation apparatus have up to 200 theoretical plates at atmospheric pressure. Spinning band distillation columns can be stacked for even higher efficiencies. They are well suited for producing high purity materials and making difficult separations. 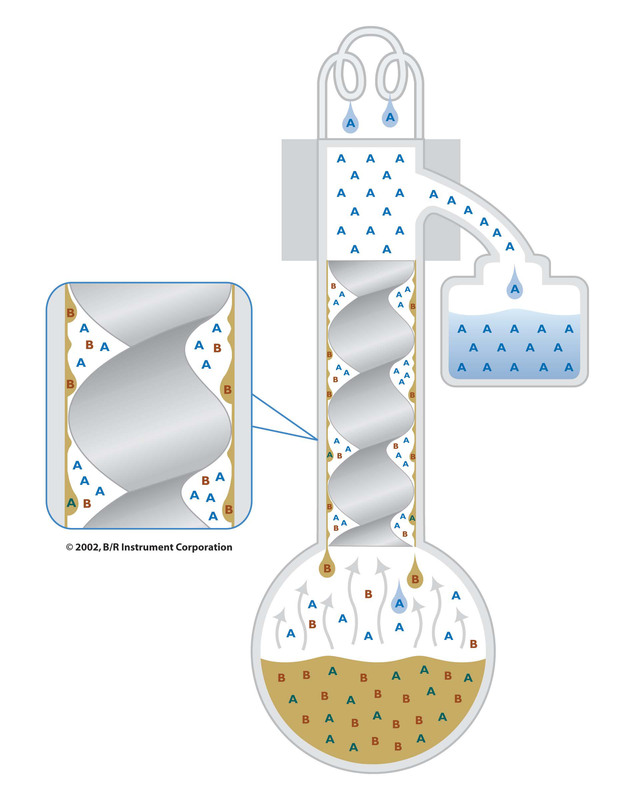 Low Column Hold Up: Because of their design spinning band distillation columns have very little liquid left behind in them after the distillation. The helical Teflon spinning band has a steep pitch, so liquids can easily drain into the boiling flask once the distillation is finished. Low hold up ensures that valuable sample is not lost in the distillation column. It also makes cleaning the equipment between distillations easy. Low pressure drop: Spinning band distillation has very high free space. As a result, there is a very low pressure drop between the boiling flask and the top of the spinning band distillation column. Low pressure drop minimizes boiling temperatures and flood points. All distillations attempt to separate a lower boiling material (A) from a higher boiling material (B). Spinning band distillation creates close contact between the vapors and the condensate in a dynamic process. It uses a helix spinning at high speeds inside the distillation column. The spinning band forces vapors into close contact with the condensate on the wall of the distillation column. This contact takes place in a very thin layer that is refreshed thousands of times per minute. As a result, spinning band distillation gives a very efficient separation in a short distillation column.